The year 2015 marked the half-century anniversary of the seminal scientific paper by Alec Douglas Bangham, Jeff Watkins and Malcolm Standish that first proposed using ‘liposome’s’, artificially-prepared spherical vesicles composed of a lamellar phase lipid bilayer, as vehicles to administer nutrients and pharmaceutical drugs. Polymun has also established a broad spectrum of analytical methods that enable development of liposomal formulations for a wide range of pharmaceutically active ingredients such as oligonucleotides, small molecules and proteins as well as vaccine antigens. Liposomes can play a key role in protecting and transporting drug to the right place and releasing it at the best rate. This enables better efficacy with reduced dose and helps to avoid side effects by enabling non-invasive application. Thus liposomal formulation can measurably improve the therapeutic index of a drug. Liposomes can protect drugs from degradation, prolonging biological half-life in the human metabolism. Liposomes can enhance solubility within the lipid membrane and aqueous core. Depending on their lipid composition, liposomes are able to localize, to target and to interact specifically with the affected tissue. Liposomes can target mucosa to encourage fast uptake of formulations and other targets to reach the skin and supporting tissue. Alternatively, liposome inhalers can target the lung. Liposomes constitute a depot of the drug resulting in sustained release. Thereby, undesired peak concentrations are avoided and availability is prolonged. This results in a lower frequency of application and the reduction of side effects. Liposomal formulations are used in cancer treatment for reducing the toxic side effects of the drug. 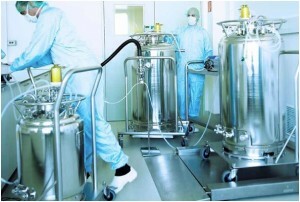 Crossflow injection is a very mild procedure that allows processing of sensitive drugs. High quality raw materials and precisely controllable process parameters guarantee high batch-to-batch consistency – essential for pharmaceutical products. Polymun technology can achieve long term stability of liposomes, even at room temperature. Polymun has transformed liposomes from a promising scientific idea into a sound industrial solution. The production technology is suitable for a broad range of substances formulated by passive entrapment, active loading or membrane incorporation. Polymun’s liposomal expertise is protected by numerous patents that cover key processes such as production of lipid vesicle, application of superoxide dismutase and liposome ‘superloading’, as well as combined formulation of liposomal composition with active ingredient. The injection module is the heart of the liposome production. The process parameters determine the size of the liposomes regardless of scale. For example, lab scale formulations can be prepared in a few seconds with 250 liters of liposome produced in just 90 minutes. Large scale also can be achieved by using several injection modules in parallel. A closed system is used for production. 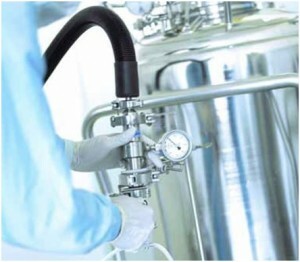 All components can be added via sterile filtration, with subsequent concentration by crossflow filtration where required. 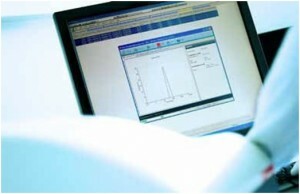 All process parameters are controlled precisely. This results in a very narrow size distribution, necessary for reliable targeting and transport characteristics. Liposome size is adjusted by modulating the process parameters during vesicle formation. No additional downsizing is required. 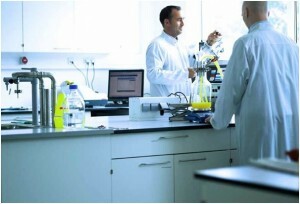 Use of high quality raw materials and precisely controlled process parameters guarantee the excellent reproducibility that is essential for pharmaceutical products. 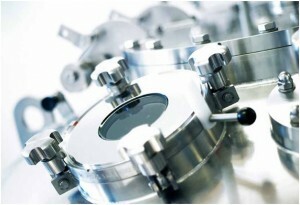 The crossflow injection technique is a very mild procedure that allows the processing of sensitive drugs. Together with the high quality of raw materials and narrow size distribution, Polymun liposomes exhibit long-term stability, even at room temperature. Polymun produces material to GMP standards, including all necessary documentation for IMPD/IND and can also assist in planning and implementation of clinical trials. Polymun uses a range of different encapsulation techniques, depending on the nature of the drug, ranging from passive trapping of hydrophilic substances, active loading of amphiphilic substances and incorporating hydrophobic drugs or membrane proteins into the membrane of the liposomes. Polymun is also able to implement third party technologies and existing customer processes at client request. Polymun can offer license agreements for developed substances on an exclusive basis. Contracts can be arranged step-by-step, on proof of concept, in-depth analysis, GMP production, product license – or all in one. Click on Polymun Liposome Technology for more information.